One critical function of sales and sales management is to capture information about clients so that you can manage your relationship with them. This should include the usual contact information like name, address, phone and email, but it should also have direct links to past history of spending – with your media and with the competition – and other information. Here are some software and services companies that may help you find the right service for your company. Need advice on getting more major account meetings, opening the sales conversation, being more convincing in your sales persuasion, probing for and overcoming objections better, and closing more business…we’re here to help. Here are some strategic tips that may help you close the deal. There are hundreds of sales books. We’d like to read them all. 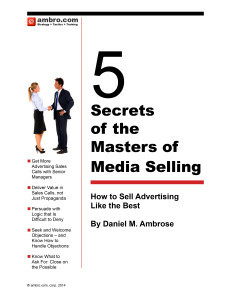 But for now, here are some that will help you win in the ultra-competitive world of advertising-media sales. Here are some books that will teach you what you need to know to help you close the deal.